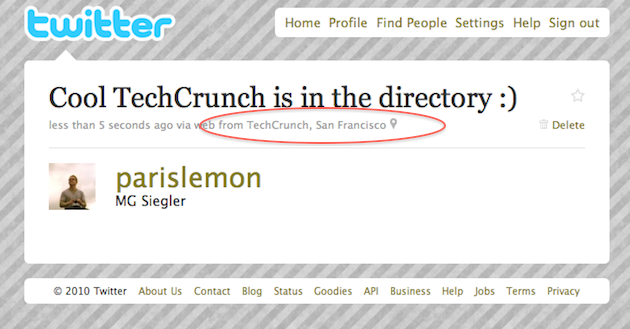 Since late last year, Twitter has included location as a key part of its API. Earlier this year, it was rolled out to twitter.com as well. But those locations have been abstract cities or areas. Starting now, Twitter is adding actual venues into the mix as well. On both Twitter.com and mobile.twitter.com, you’ll now be able to tag tweets to specific places (such as venues), Twitter notes on its blog today. And clicking on those location names will bring up recent tweets from those places. Twitter says this is perfect for the World Cup matches currently going on in South Africa. Notably, this also will work right off the bat with Foursquare and Gowalla — two of the most popular check-in services. When you click on a venue that has Foursquare or Gowalla information attached to it, you’ll also see check-ins at those venues on twitter.com. This is a big win for both of those services. 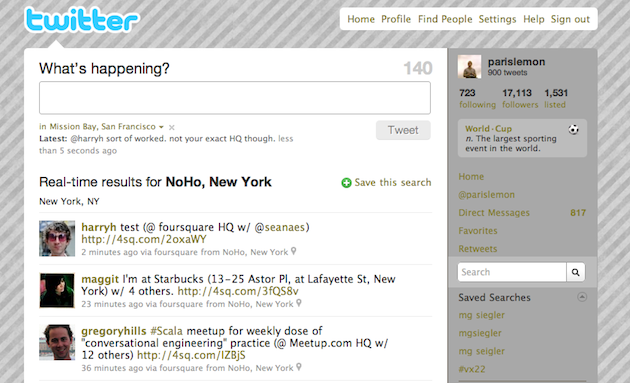 This new place information works with the Twitter API as well. Over the next week, it will be rolling out in 65 countries around the world thanks to data partnerships with TomTom and Localeze. And alongside this launch, Twitter notes that the location functionality is working in more browsers, such as Internet Explorer and Safari (in addition to Chrome and Firefox, where it has worked for a while). And soon, Twitter Places will come to the native mobile applications for the iPhone, Android, and BlackBerry. All of this means huge things for location on Twitter. And the fact that this place data ties in with both Foursquare and Gowalla is excellent. But there still eventually needs to be some sort of unified place database. Maybe Twitter Places will help produce that. At least until Facebook’s location solution comes out and is inevitably incompatible — I kid, I kid. Or do I? And don’t forget Google Places.